A couple of weeks ago – Holy Week, actually – my dad, the other Pastor Havel, came to my office looking for a picture of Jesus, the Good Shepherd. He didn’t say it that way. He just wanted a picture like one many of us have seen in illustrated Bibles from back in the day or even on stained-glass windows in many of our churches, where Jesus is walking around carrying a lamb. You know the one, right? Anyway, he was looking for something he could use for the Children’s Sermon at First Trinity Lutheran Church, where he’s become the resident supply preacher since moving to Indiana. First Trinity, some of you know, is on Indy’s east side – Emerson and 42nd Street – and they have a much more racially diverse congregation than we do here at Cross of Grace. I mean their flock is a little more colorful than our own. I mean their flock – however small – is blessed with a better mix of black sheep and white sheep on any given Sunday morning. …I suggested we find a picture of a BLACK Jesus; a more historically accurate picture of “the Good Shepherd” from the ones so many of us are used to; a picture of Jesus with dark skin that might even surprise a gathering of African-American children who are used to worshipping in an ELCA-flavored Lutheran church where Jesus is so Norwegian so much of the time. 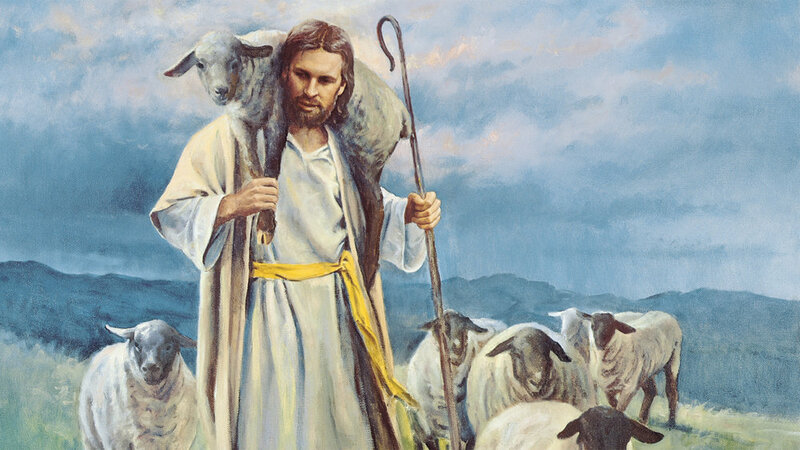 At least, I thought, we could find a picture of Jesus carrying a black LAMB for the good of the cause. Well, I never did hear how the children’s sermon went. But I like the idea of all of that – imagining the historical Jesus as a young, middle-eastern, dark-skinned, young man – which is more of a reality check for me, still, than it should be a lot of the time, to be honest, no matter how “woke” I pretend to be. And it’s good for me to remember this more often – and it came to mind again for this morning because of something Jesus says when he describes “The Good Shepherd” in John’s Gospel. And he says a lot about the Good Shepherd: how he lays down his life for the sheep. How he doesn’t run when the wolf shows up. How he is more than just some hired-hand, some imposter, some poseur who’s in it for his own benefit and blessing. No. This Good Shepherd lays down his life for his flock because he cares for the sheep, because he loves his people, because God has a great, wide, deep, kind of love for God’s flock – and for those outside of the fold, too. Did you catch that part of it all? So we have to wonder – like those who first listened to Jesus must have wondered – “Who are the ‘other sheep’ in our mind’s eye?” Who are the ones “not part of this fold?” Who is it we wish the benevolent love of God, in Jesus, would find and fill and forgive and redeem? Who might join us … join the flock … to celebrate those blessings right along with us? Are the “other sheep” Jesus is talking about people who don’t look like us? Are the “other sheep” people who live on the other side of the tracks? Are they people who believe differently from us – Muslims or Jews? Catholics or Missouri Synod Lutherans, even? Are they people who don’t believe at all? Are they people who are more sick or more sinful that us; differently sick or differently sinful from what we’re used to? I think so. I believe the one flock into which God longs to gather all of creation is meant to be a surprisingly diverse and colorful, motley kind of crew. But if you’ve heard that sermon from me before, you’ve heard it a hundred times – and you’ll hear it again, I’m sure. This isn’t about that for me this morning. Because in John’s gospel we know Jesus was speaking to his Jewish disciples and hangers-on when he talks about “the other sheep who do not belong to this fold.” We hear Jesus speaking about how God’s good news and Gospel joy; God’s salvation and redemption and grace for all people wasn’t just for the Chosen ones of Israel, but that it was also for the Gentiles; those outside the circle of the Jewish faith. They were “the other sheep who do not belong to the fold” Jesus was talking about. …in a very subtle, under-stated, truth-telling kind of way, this teacher reminded me that, based on all of the social and cultural and theological indicators of Jesus’ day and age, that I would be considered an outsider to the kingdom of God, as far as Jesus and his disciples were concerned. I – as a white-privileged, middle class, non-Jewish, Gentile man – would have been an ethnic minority in the Kingdom of God about which Jesus preached. I would have been a minority in every way as far God’s Kingdom was concerned, in Jesus’ day and age. I am not what Jesus or his followers would have considered part of their fold; part of their inner circle of chosen sheep. Most of us – from what I can tell – would be considered among “the other” who Jesus would welcome into the fold against the better judgement or first inclination of his disciples. And this humbles me in a way that is helpful and holy as I consider how “woke” I think I am or hope to be. I am not first on the list. I am not among the inner circle. I am an “other” in so many ways as far as the Good Shepherd would have been concerned, back in the day. But bound together by nothing more and nothing less than the grace of God. And bound together by the love of this Jesus – the Good Shepherd – who calls and gathers, who welcomes and forgives, who enlightens and encourages each of us, for the sake of the world: until the last are first and the first are last; until the low are raised up and the mighty are knocked down from their thrones; until the poor are rich and the rich learn to share; until we see ourselves as part of the same flock. And until we are filled with a holy kind of humility and gratitude for the blessings we celebrate, which were not considered ours in the first place … so much so that we are sent into the world – beyond the comfort of our own fold – to love and to serve and to be loved and to be served by the ones we have made “others” in spite of ourselves. Because in that day… when that Kingdom comes to earth as it is in heaven… we will be one flock, as God intends – and that will be a surprise and a blessing for us all.